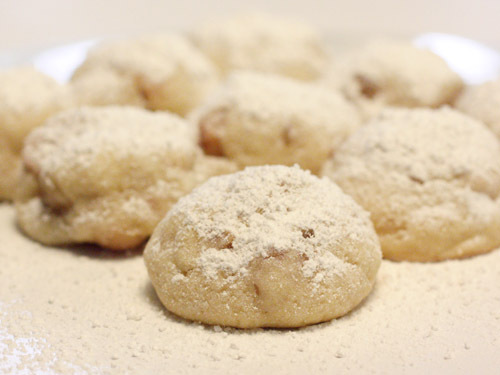 Snowballs, meltaways, and wedding cookies are very similar in style and deliciousness. 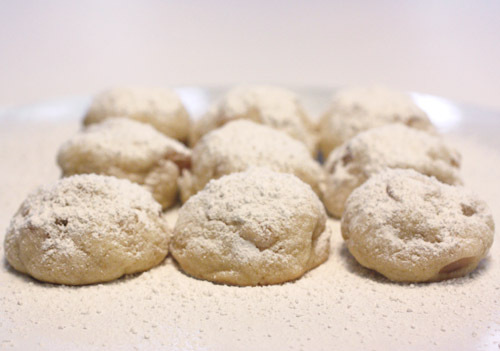 My grandma used to make a pecan snowball kind of cookie which I loved, but then I discovered the Hawaiian snowball and that changed everything. Last weekend was our Austin food bloggers’ cookie swap, and there were more varieties of cookies than should be legal in one house. We each brought six dozen cookies and then chose from the whole collection which ones we wanted to take home. Deciding what kind of cookie to take to the event was difficult. I had to try a couple of new recipes and one old favorite and ended up making three kinds of cookies for the swap. I’ll show the other two soon, but these Hawaiian snowballs were my first choice. The idea came from the December 2003 issue of Living magazine, and I’ve made them several times since that issue appeared. For the sugar cookie dough itself, I used my favorite recipe of all time which happens to make the best sugar cookies ever. That best ever sugar cookie dough, Ethel’s sugar cookies from the 1960 Betty Crocker cookbook, was mixed and then left to chill in the refrigerator overnight. The next day, I let the dough come to room temperature and turned it out onto a floured surface. The dough should be flattened somewhat into an oblong shape. Chopped macadamia nuts and chopped, dried pineapple were layered on top of the dough, and then the dough was folded and kneaded until the nuts and fruit were incorporated. 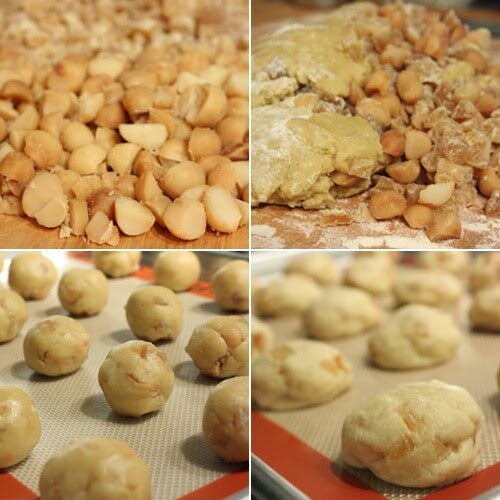 Then, you just pull off pieces of dough, roll them into one inch balls, and place them on lined baking sheets. I baked them for about 13 minutes at 400 degrees F, but they should be checked after 10 minutes and then watched. After they cooled, they were dusted with confectioner’s sugar, and I put the sugar in a sieve and shake it over the cookies so no lumps land on the cookies. The result is a tender, little cookie with a snowy top. The roasted, salted macadamias are a nice contrast to the chewy, sweet pineapple, and I already explained that this sugar cookie dough is the best there is. It really is. And, what can I say, I like Bing Crosby’s “Mele Kalikimaka,” and these cookies go perfectly with that song. Totally delicious. I really have to try your sugar cookies. Macadamias are among my favorite nuts. It's just a shame they are so very expensive here, but these cookies look gorgeous! Wonderful. I love that you used macadamias. I adore them. Oh yum, these look just too good to be legal. I've stayed away from making cookies so far, it just seems that I wouldn't be able to stop once I start. Macadamias! wow....the cookies must have tasted heavenly! this particular collection of cookie (and cake and muffin and bread) add-ins is very appealing to me. i also love this type of cookie, so you get two thumbs up from this gal! I like the sound of these! I make snowballs with walnuts or pecans but this is a whole new approach and sounds amazing! Thanks for sharing! Those cookies must be heavenly! I love those nuts! I love cookies like this...so wonderful and snowy looking! These are a fave of mine! I learned about these during my 2.8 year stay in the States! These sound just heavenly with macadamia nuts! From the way they are dusted with "snow", they look like Japanese mochi. These sounds absolutely delicious with macadamia nuts! And their so pretty. They are a lot like my pecan sandies, only better! Ohh I've never heard of hawaiian snowballs! Yummy! When we're all shivering this winter, you're there to brighten our days with cookies from the tropics. Love the chewy pineapple bits in these. It's like sunshine amid all these gray skies. Yum, I love macadamia nuts. I have to give these a try for sure. MMMMMMM,...these snowballs look so delectable, Lisa!! I so love the fact that this is the first time I've heard of this cookie! It sounds amazingly good and just the name makes me smile! These really look awesome! I have always loved snowballs - but the Hawaiian flair to these makes them really special! What a great twist on traditional snowballs - the macadamia nuts and pineapple sound so yummy in them! I absolutely adore these cookies but haven't ever had a recipe. Thanks for sharing... I can't wait to try this out. They look so pretty and festive! Made a similar cookie with hazelnuts last year. This year it was walnuts. They are the type of cookies that do not last long. Great idea! Snowball cookies are a Christmas must have and I'd love to try them in other flavors.